Ada and Darcy: Pretty enough for a dinner party! Pretty enough for a dinner party! Isn't this wedding decor just divine. 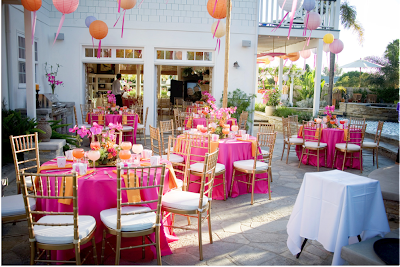 I adore the stunning use of flowers, the parasols as well as the lovely lanterns. I think what appealed to me about this styling is it's simple yet effective approach and you don't need a wedding as a reason to create such a beautiful look. Personally, i would be happy to create something pretty like this for a birthday or dinner party with the girls. I came across this lovely work through the gorgeous Wanderings of a Wannabe. 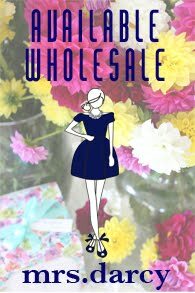 It's a darling blog with lots of personality!! This is my philosophy as well Kellie! 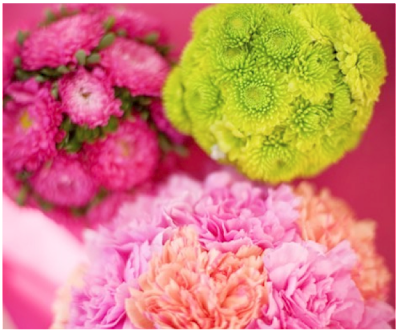 All of these beautiful event styles shouldn't be thought of as being just exclusive to weddings. I would be really excited if I went to a friends party and they had used just a few of these elements to add a little something extra to their occasion. Great post! Wow I'm really loving colour. It seems to be perfect for summer weddings. The styling is so beautiful and I adore the parasols. They look like those drink umbrellas. This would be lovely for a girly party. Love this and the parasols are great! 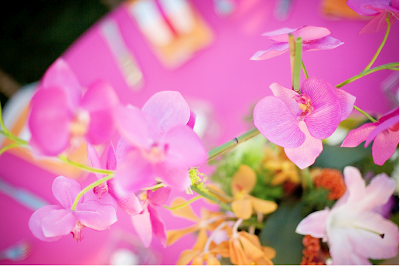 I adore the floral perfection too- fun to see the parasols pick up those colors. And of course the pink shoes! I love these colors, and the parasols are fantastic! I'd love to use parasols for a party. Fabulous as always, Kellie! So cheerful...love all the colour combo! Perfect for summer indeed! The colors are great! I feel more awake and alive just from reading this post, and I haven't even had my coffee yet. oh gorgeous! I would love this for a party! beyond fabulous! love those colors. 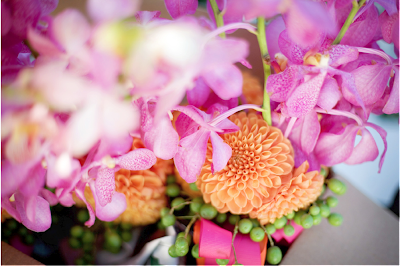 I LOVE the pink and orange color combination as well as all of the Chinoiserie touches. I'm going to send this to my sister (who is newly engaged)! And the way pink and orange match it always blows my mind away!!! Absolutely gorgeous. It just confirms my love of pink and orange together. 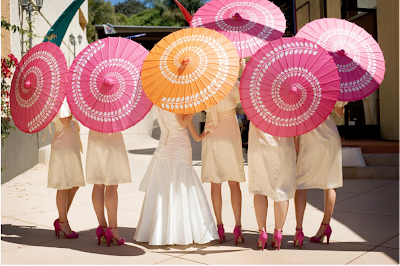 The colors combinations are perfect...I love hot pink and orange together..the parasols are lovely, but I really like that the bridal party all wore pink shoes to match..nice touch and how much fun! this is the cutest, most happy post!! i love it! i would definitely want my party to look like this. Ah, the colors of "Happy Love"..!!! 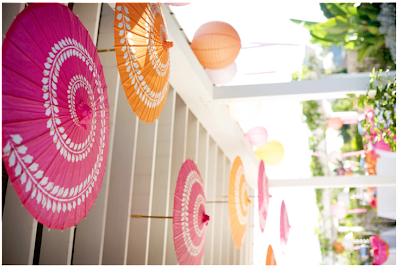 The gorgeous parasols and pink high heels is so visually stunning. The parasol shot takes the cake! such pretty colors! great post! very beautiful pink! So beautiful. I've always loved that color combo. I especially enjoy those pink shoes! Divine!!! Im only a fan of orange when combined with either Turquoise or fuchsia so this is a happy bowl of eye candy for me. So sweet I need to go brush my teeth!!! Love it..thank you for finding it! !